Jeanette MacDonald, with her lovely soprando singing voice, became an early sound era star in films with Maurice Chevalier, and into the 1930s and 1940s with Nelson Eddy. After her film-making dropped off, she appeared on stage and television in addition to releaseing many recordings. Jeantte MacDonald introduced much of America to grand and light opera. Born into comfortable circumstances in Philadelphia of Scottish, English and Dutch stock, Jeanette was taking dancing lessons and performing in kiddie shows by age nine. In 1919, she and her older sister Blossom lit out for New York, where Jeanette landed a job in the chorus of The Demi-Tasse Revue. Her climb up the Broadway ladder during the 1920s was tough-going, but by 1927, she was starring in Yes, Yes, Yvette, which unfortunately flopped. She had the lead in Sunny Days in 1928. Signed on with the Schuberts, MacDonald starred in Angels (1928) and Boom Boom (1929). Film star Richard Dix wanted to induce MacDonald to be in a film with him, but the Schubert's wouldn't allow it; when director Ernst Lubitsch wanted to use her in his first sound film The Love Parade (released in January, 1929) with Chevalier, the Schubert's contract was bought up by Paramount. MacDonald was kept very busy. The Vagabond King (released in February, 1930) with Dennis King; and Monte Carlo (released in August, 1930) with Jack Buchanan. MacDonald was more successful when paired with a strong musical partner — some of her films were commercial dissappointments. In 1931, she took a break and did a concert tour of Europe. Upon returning, Paramount teamed her once again with Maurice Chevalier, and they made both One Hour with You (released in March, 1932), directed by Ernst Lubitsch and George Cukor, and Love Me Tonight (released in August, 1932), directed by Rouben Mamoulian. Switching to Metro-Goldwyn-Mayer, the Chevalier / MacDonald team made The Merry Widow, again for director Ernst Lubitsch; the film was playing the night the Chevalier / MacDonald imprinting ceremonies were held onstage. 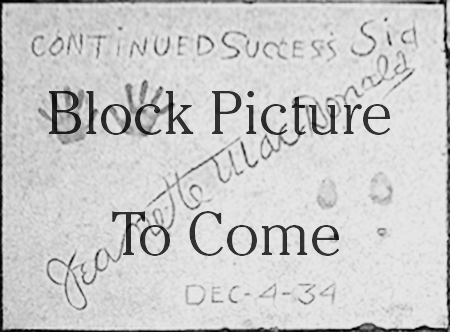 This time, the blocks were successfully transferred to the Forecourt (unlike the Jean Harlow imprinting), but with few exceptions, the habit of remote imprinting had not been done much until more recently. With Naughty Marietta (which played the Chinese in May, 1935), M-G-M paired her with a young baritone named Nelson Eddy, and the picture, with the song "Ah! Sweet Mystery of Life" became a popular and critical success. Rose-Marie, also with Eddy (and which played the Chinese in January, 1936) was one of the biggest hits of the year, as was San Francisco, where MacDonald co-starred with Clark Gable and Spencer Tracy (and which played the Chinese in June, 1936). After a tough production, Maytime (which played the Chinese in March, 1937) with Nelson Eddy became a huge hit, and is considered the best of the MacDonald / Eddy films. After her marriage to actor Gene Raymond, M-G-M spun MacDonald and Eddy off into their own films, with MacDonald headlining The Firefly with Allen Jones (which played the Chinese in November, 1937). But audiences were annoyed with this breakup of the team; M-G-M reunited them for The Girl of the Golden West (which played the Chinese in March, 1938), but the two stars had no duet together, and the film flopped. Sweethearts, filmed in Technicolor in 1938 fared much better (and which played the Chinese in December, 1939), becoming a worldwide smash hit. Broadway Serenade (played the Chinese in April, 1939) had her re-doing the A Star is Born storyline with Lew Ayres, but MacDonald's heart wasn't in it; she bugged out to do a concert tour, then relented and made New Moon with Eddy (played in June, 1940), and the Technicolor Bitter Sweet, also with Eddy (played inNovember, 1940. Technicolor was also used on the remake of Smilin' Through with Brian Aherne (which played in October, 1941). I Married an Angel (which played the Chinese in July, 1942) became the last of the MacDonald / Eddy films. Eddy bought out his M-G-M contract and signed up with Universal. MacDonald was shoved into Cairo with Robert Young (who couldn't sing); the film played the Chinese in October, 1942. MacDonald eventually followed Eddy to Universal where she made Follow the Boys (released in May, 1944); the pair attempted to find something to reunite themselves onscreen, but nothing came of it. In the meantime, MacDonald / Eddy made many appearances on radio. She returned to M-G-M for Three Daring Daughters with José Iturbi (released in March, 1948). Her final film would be The Sun Comes Up with Lassie (released in May, in 1949). MacDonald did frequent concert dates between pictures, singing on several occasions at the Hollywood Bowl and Carnagie Hall in New York City. She did command performances at the White House for both Harry Truman and Dwight Eisenhower. 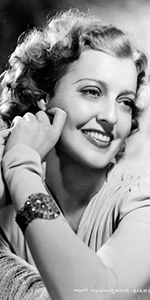 While writing her memoirs in the early 1960s, Jeanette MacDonald developed a brian tumor as well as continuing heart problems. She was given an arterial transplant at Methodist Hospital in Houston, Texas, but she developed pleurisy, requiring a lengthy hospital stay. She and Raymond downsized, but in late 1964 was admitted to the UCLA Medical Center and was operated on for abdominal adhesions. She was well enough to see a specialist in Houston. She was fed intravenously to build her up for surgery, but she succumed with husband Gene by her side. She was 61. Nelson Eddy wept over her death on The Jack Parr Show. Grauman's Chinese Theatre, Hollywood, California. Maurice Chevalier and Jeanette MacDonald imprinting ceremony, Thursday, December 4, 1934. 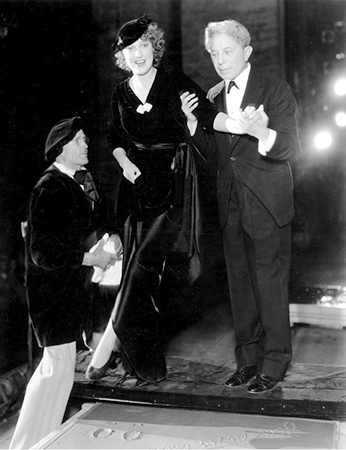 Jeanette MacDonald is assisted in making her footprints by cement artist Jean Klossner and Sid Grauman on the stage of the Chinese Theatre. Grauman's Chinese Theatre, Hollywood, California. Maurice Chevalier and Jeanette MacDonald imprinting ceremony, Thursday, December 4, 1934. 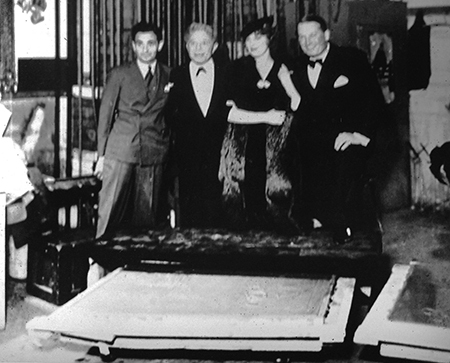 Left to right: An inidentified man, Sid Grauman, Jeanette MacDonald and Maurice Chevalier stand behind Chevalier's block, with MacDonald's on the right.